Psssst, don’t tell the Yanks anything and did Russian agents kill Paul the Octopus? The most over used word in business is transparency. The moment someone glibly throws it into to a conversation I can’t help but think they are hiding something. The US government in particular has rightly been very forthright in promoting transparency in business and pursues a very aggressive anti-corruption policy. With this in mind it seems a bit odd to me when Hilary of Clinton fame complains bitterly about WikiLeaks. There has been lots and lots of juicy stuff in The Guardian (one of five publications worldwide WikiLeaks sent the transcripts to). If you fancy doing a bit of snooping click on the link below and all will be revealed. Given the US’s determination to throw the declaration of independence at the Asperger-suffering British man, Gary McKinnon, who hacked into the Pentagon to look for UFO sightings, I’m surprised they have been furiously attacking WikiLeaks’s server and trying to drive it offline. One of my favourite leaks was the Burmese military junta thinking of putting in a bid to buy Man U prior to launching their world cup hosting bid (surprisingly the world cup has never been to Burma). Did Putin have it in for Paul? As regular readers will appreciate I can’t help but drift towards the sporting angle whenever I read a grown-up story. It might be a wee bit tenuous but the leaks relating to Russia were particularly interesting. To the surprise of nobody it transpires that Russia is a Mafioso state controlled by gangsters who are in collusion with key government figures, in other words Russia is rotten to the core. Given this I loved what Putin had to say about Russia winning the right to host the World Cup in 2018. Arriving in Zurich on Thursday night to meet with Sepp Blatter, Putin accused the British media of running an “unacceptable” campaign. 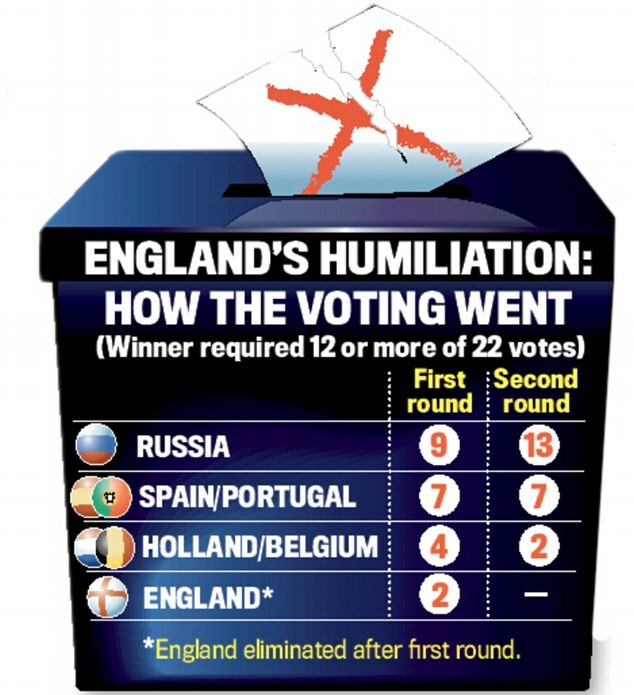 One key thing every commentator I’ve read has missed is the previously flawless Paul the Octopus had England down to win the big vote. This leads me to think that Russian agents were sent to take out Paul and thereby remove his influence. Nobody I know thinks that FIFA is anything but a personal plaything for Sepp Blatter and his serial bung-taker chums. Sepp Blatter congratulated Hitler in a speech praising the Austrian for trying something new. The choice of Russia and the resounding success of Qatar, the two bids with the largest budgets and the lowest marks in FIFA’s technical assessment, also brought questions over the decision. We need to get used to the fact that Blatter has a personal legacy ‘take it somewhere new’ agenda – the only country to win against his agenda was surprise, surprise, Germany. One thing I found very odd was two people who voted for Holland in round one and then voted for someone else in round two. Six years to decide but just 10 mins to tactically change their mind once England had been eliminated. Name and shame! I can however understand Russia winning (graphically showing the imbalance between east and western Europe when it comes to staging World Cups (0 – 10) scrapping visas for fans and free public transport during the tournament were the icing) however I’m staggered that Qatar won until I noticed the favourite to succeed Blatter is a Qatari, take a big bow Mohammed Bin Hammam, the FIFA executive member and president of the Asia Football Confederation. My good friend Micky Brigg mentioned that it will only take one hour to travel between the two furthest apart stadiums . . . at a slow amble! 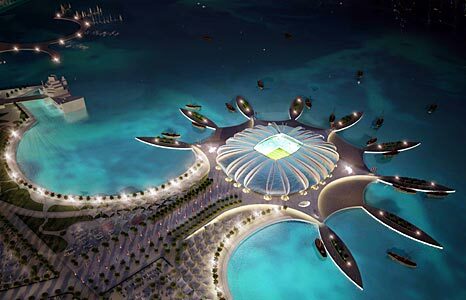 Here is an artist’s impression of one of their showcase stadiums which they planning to pack up afterwards and ship to Africa. I could go on forever about the World Cup but I’ve got to move on. Here is a ‘must-watch’ video, it made me cry with laughter. Some dude turned up at the BBC for an interview, got mistaken for technology expert and ended up being interviewed live on national TV. His face when he’s introduced is a picture. And here is a competition that you really can win (assuming I don’t win it). 1,000,000 Air Miles which will get you to the next half a dozen World Cups (unlike Skywards points Air Miles never expire). As news broke about sharks eating people in Sharm El Shiekh apparently 28 million people in the UK have been injured by biscuits. 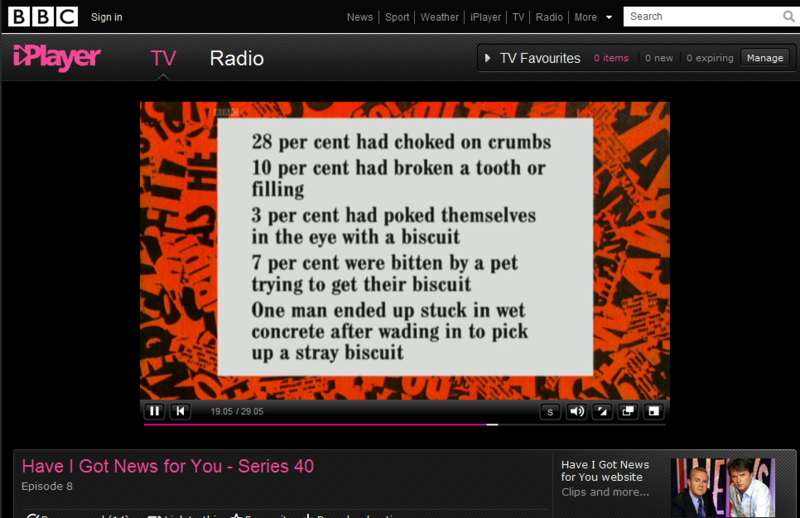 Here is a breakdown of the injuries caused by our crumbly friends. Sound about right? Let me know in the comments. It’s a bit off-kilter for me but I’ve decided to dedicate a good chunk of this blog to advertising and in particular the billboard posters political parties use to convince people to vote for them. I’m going to start my thesis with the best poster of all time. It was produced for Maggie by Saatchi & Saatchi, an agency headed by two brothers who were doing quite well before being catapulted into the stratosphere when they landed the Conservative account for the 1979 election. Unleashed on an unsuspecting public 30 years ago the poster helped propel Maggie into power for the next too-many years and turned the Saatchi brothers into advertising geniuses. Maggie went on to destroy British industry (sorry Camla) and Charles went on to marry Nigella Lawson; enough said. Hats off to Saatchi and Saatchi, they managed to persuade my dad and millions like him to vote for a woman. To be fair to my dad’s political allegiances he was a little put off the Liberals at the time by Jeremy Thorpe’s dodgy behaviour. This time we have got some great posters to enjoy. An air brushed representation of a not very old-looking old Etonian trying to talk to the common man and a Scot doing what they do best. By the way did anyone see the Sky News interview with Sir Alex after his horse won at Aintree? He couldn’t string one word together! To finish my poster story here is my favourite for worst-ever poster. Incredibly it won a prestigious award for Poster of the Year. You’re having a laugh springs to mind. I suspect the advertising agency responsible for this shocking effort were all secret Labour supporters. Which brings me nicely to my observation about advertising – do you need to believe in what you are advertising? For example if you are the agency for HSBC do you need to believe they are the best bank in the world? At this point I’m going to take the Fifth Amendment and move swiftly on except to say I love the fact that Atom have just picked up Air Miles who last week helped turn our everyday shopping into a new Sony digital camera that was going to cost me AED 1,500. My favourite local ad campaign of the week was for the Dusit Thani Dubai hotel. A couple of years we did a ‘pay what you want’ campaign for Grand Hyatt ; you went to Andiamo, had a meal and then paid whatever you felt it was worth. Partying Scots put paid to that great idea. This time the Dusit has gone for a different approach. The hotel has launched a quick-bite campaign whereby you pay AED 2 (0.5 USD) for every minute you are in the restaurant. They have obviously never seen the Prosser family demolish Spag Bol in 39 seconds flat. In fact we could take our two Border Terriers along and collectively demolish the buffet for a total cost of AED 12. Goodness me I’ve just come across the worst, most inappropriate TV ad of all time and it’s brand spanking new. Nike has dug up Tiger’s dad to help sell more trainers – it’s a real shocker. Finally to finish off here is some very sound advice. If you are thinking of buying an iPad don’t whatever you do buy it in the UAE. The price for the 16GB version quoted in Arabian Business is $1,225. On the Apple US website the same iPad is selling for $629. Quoted, the reseller said the price difference is down to import duties (4%) and delivery costs. They must be flying them in first class with each iPad having its own seat! Sorry, said finally but I had forgotten about my top fives – best British Prime Ministers ever (I’ve even left one in for Cam). Maggie probably deserves a spot for being the first female PM and being tough enough to face up to the unions, but on the flip side she championed the greed society that led to rich people getting richer and poor people getting poorer. 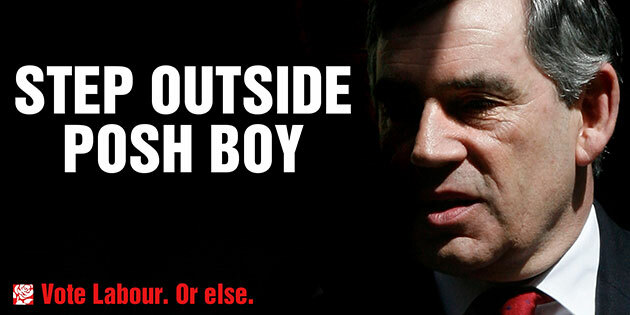 By the way for all of you who loved the Gordon Brown poster it was an April Fool in The Guardian!